DOBBY 6" Plush Pendant Keyring - Steiff HARRY POTTER 2018 Edition - 355158 NEW! Steiff Hello Kitty - 2010 Limited Edition - no paperwork. Condition is Used. Shipped with USPS Priority Mail. Looks like they have been just sitting on a shelf. Overall good condition. About 12 1/2" tall. Fully jointed, shoebutton eyes, twisted floss nose and mouth, felt paw pads excelsior stuffedPlease check out the other items I have. Thanks for looking! Overall excellent condition. About 18" tall. Fully jointed, shoebutton eyes, twisted floss nose and mouth, felt paw pads excelsior stuffed. Wonderful mohair coverage with some light mohair thinning. Please check out the other items I have. Thanks for looking! Note the back of the right leg. It has the look of old mohair. New ListingSteiff Jackie Teddy Bear Replica of 1953 0190/25 10"
I don't have her box/cert. Overall good condition. About 13 1/2" tall. Fully jointed, character glass eyes, twisted floss nose and mouth, felt paw pads excelsior stuffed. Unusual neck and posture. The left arm is a little darkened. Please check out the other items I have. Thanks for looking! An original, antique, early 20th century, 14" tall, jointed teddy bear which while it no longer has its button in its ear I believe to have been made by Steiff. The bear features shoe button eyes, black thread sewn claws and nose and has large club feet, curved long arms, a triangular shaped head which is tightly stuffed and has a humped back. Felt face & hands, Steiff silver ear button. Little 4" Steiff baby monkey isn't included in. Approx 11.5" (29 cms) long, mohair fur. A lovely addition to any monkey collection. All in very good condition with perfect felt. ANTIQUE STEIFF TOY. Approx 2.5" (6.5cms) tall. Made of wool pom-poms. with a turnable head, black glass eyes & felt beak. Very good condition just slight wear to the paint. Bel Ours Ancien. Ours d'époque avec une grosse bosse qui remonte dans le dos. Je m'attache à décrire les objets au mieux. 4 Steiff animals are produced in the 60's/70's years. Only the buzzle rooster doesn't possess any ID's anymore. ST E IF F ANIMALS. Bei Reklamationen muss das Kaufdatum mit einer Rechnung nachgewiesen werden. 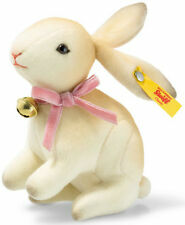 All 7 Steiff animals are produced in the 60's/70's years. All other Steiff animals don't possess any ID's anymore. Bei Reklamationen muss das Kaufdatum mit einer Rechnung nachgewiesen werden. ST E IF F ANIMALS. WOW! Fantastic Early 1900's Felt Clown Doll with Glass Eyes Steiff ? Overall excellent condition. About 12 1/2" tall. Made of felt,with glass eyes, excelsior stuffedand non-working pish tummy squeaker. So cute! Please check out the other items I have. Thanks for looking! Old Vintage German Steiff Toy GRISSY Donkey Seaside Doll Bear Display ? Get images that. make Supersized seem small. With Steiff ear button, id no. 5720/20. make Supersized seem small. We will try to help you and solve your problems! - I can assure you that you will get a product made out of high-quality materials. It will help us grow and allow. - The products I send are exactly like the ones shown in the pictures. Overall excellent condition, about 9 1/2" tall to the top of the head. Felt mane, tongue and teeth. Excelsior stuffed. check out the other items I have. Thanks for looking! In 1913 Steiff Company produced Teddy Bears in red, white and blue to mark a famous American election. This Bear was a new design, of Clown format, with a fine hand crafted satin ruff, and it was so popular, that they made Dolly in other colours, - green/yellow, and in this case, in dusky pink and white. Dolly is made in fine mohair, and is a mega cuddly12" . The Bear is five ways jointed and has hand stitched nose and mouth, smart orange satin ruff, and of course gold button with white tag as well as chest tag. The Dolly in the photo is the actual Bear for sale, Dolly is one of only 2,006 produced. All 3 Steiff animals are produced in the 50's/60's years. Both lions have a raised script silver button. The kangaroo doesn't possess any ID's anymore. ST E IF F ANIMALS. >>> ~ Good Luck ~ < <<. also the Kango's plastic baby. Felt face and hands, Steiff button in foot. The bigger 11.5" Steiff mommy monkey. Approx 4 1/4" (11 cms) long, mohair fur. A lovely addition to any monkey collection. Positionable limbs & all in good condition. All solid with no holes or repairs, please click description for more info & SIXTEEN large photos. All 4 Steiff animals are produced in the 60's/70's years. The other steiff animals don't possess any ID's anymore. ST E IF F ANIMALS. >>> ~ Good Luck ~ < <<. Now you have to wait for your invoice. Er haftet wegen der Leistung auch für Zufall, es sei denn, dass der Schaden auch bei rechtzeitiger Leistung eingetreten sein würde. Steiff id. no. 7123/09, ideal for Easter display. Made of wool pompoms with a turnable head. Note that I have listed the Steiff Bear as new because he appears to still be attached to the box. It is a 1926 replica. This bear was made in 1986. This bear is comprised of cream colored mohair. ABOUT 1 13/4" TALL. I THINK THESE HAVE BEEN RETIRED. 1960's 1970's STEIFF Sitting Teddy Bear 2 Color "Zotty" Mohair West Germany 8"
A little pilling to wool of smaller bird. Grey felt beaks. Brown felt tails. One bird has fading to colours. Plastic legs brown felt tails. Grey felt beaks. RARE Early Steiff Teddy, Centre Seam, Blank Steiff Button,Tan Colour C. 1900 17"
click description for 15 large photos. Steiff Bear Lilly Dangling Teddy Bear EAN 111556 Soft Plush 11"
Steiff Jackie Teddy Bear Replica of 1953 0190/25 10"